For anyone who wishes to validate the profound and tragic erosion of British cultural and moral values over the last seventy years, these documentaries are indispensible. These glimpses of the past are a melancholic reminder of the present lamentable impoverishment of British cultural identity and self-confidence across all social classes. They demonstrate how rich, demanding and spoilt we have become but also how living conditions and the environment have improved exponentially. Britain seems perenially a victim of its own acute social conscience, tolerance and good intentions...but enough of this. A couple of days ago I learned that one of my favourite young pianists in the 2010 Chopin Competition, the Italian Irene Veneziano, would be playing at a private concert in the Royal Castle in Warsaw at an event mounted by the outgoing Ambassador of Italy to Poland, Signore Aldo Mantovani. 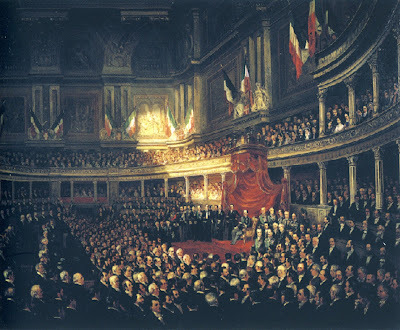 The concert was to celebrate the 150th Anniversary of the Unification of Italy. On a chill, windy evening I slid between the assembled ranks of black and silver Mercedes diplomatic cars to receive an embossed invitation pressed into my hand by a uniformed guard at the mighty entrance. This would turn out to be an all Italian evening with a vengeance. The Ballroom of the Royal Castle is a superb musical venue and an aesthetically overwhelming room. Domenico Merlini, the distinguished eighteenth-century Italian architect from Brescia who brought Palladianism to Poland, designed it with the allegorical guidance of the Polish King Stanisław Augustus. 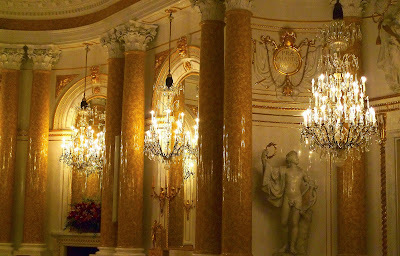 New gold leaf glisters from every crevice in a blaze of mirrored chandeliers. A small orchestra made up of members of the Teatro all Scala Orchetra, I Virtuosi del Teatro alla Scala, together with their dashingly handsome conductor Massimiliano Caldi, had been especially flown in from Italy. The glamorous audience seemed to be made up of the entire Warsaw Diplomatic Corps, a testament to Signore Mantovani's popularity and the tremendous enthusiasm for all things Italian in the capital. The concert was accompanied by a very interesting photographic exhibition devoted to the Risorgimento and Unification. I was particularly taken with a photograph of Garibaldi's super tooled leather boots. The concert began with a fine and brilliantly idiomatic rendition (not at all surprising in view of their origins) of the Overture to Verdi's Nabucco. The Teatro alla Scala Orchestra, is considered one of the world’s finest orchestras for opera productions and has reached an unassailably prestigious international position. The orchestra is also known for its symphonic activities. I was particularly struck by the rich and mellow sound of this small string band with its fine 'mahogany' cellos (the First Cello of the Teatro alla Scala Orchestra is a member of this group and a fine musician indeed). Maestro Caldi conducts in an exuberant, luxurious and sensual manner with a fine grasp of the Italian orchestral sweep that satisfies all one's imaginative flights of how a gifted Italian conductor ought to behave. After the Verdi, the beautiful Fazioli concert grand piano was then wheeled across for Irene Veneziano to take the solo part in Fryderyk Chopin's E minor Concerto Op. 11. I was full of anticipation as I had been prevented from hearing her perform this work in the Chopin Competition last year as, in my humble opinion, the judges had inexplicably excluded her from the finals of the competition. Elegantly dressed as ever, she began the Allegro maestoso in a noble and classically restrained manner, not overtly romantic but with a true understanding of the period Varsovian classical styl brillant so characteristic of this work. The influence of Hummel and John Field must never be overlooked in the sometimes irresistable temptation to over-romanticise the interpretation of Chopin. The Romanze (Larghetto) sang with the beautiful bel canto of Bellini so beloved by the composer. The radiant tone Veneziano extracted from the Fazioli instrument perfectly suited the nostalgic yearning of young love that so suffuses this music, a love song full of ardent emotion. She is never sentimental but plays with a Mozartian poise and refinement. This was much in evidence in the exuberant, dancing Rondo which concludes the work, so full of youthful charm and delight. At times Maestro Caldi conducted with, for me at least, rather stylistically inappropriate passionate romantic phrasing. I am sure the aristocratic Chopin would have found it faintly alarming. Occasionally I felt a slight mismatch of conception of the work between conductor and soloist. However these are the quibbles of my personal taste and it was a very fine performance overall as evidenced by the enthusiastic applause. As an encore she performed with great panache the technically demanding and highly entertaining Saint-Saens Toccata - Etude Op. 111 No.6. We then heard a stirring piece of Risorgimento music, the Romance for Clarinet and Orchestra, Lontano dalla Patria, by the Italian clarinettist and composer Ernesto Cavallini (1807–1874). 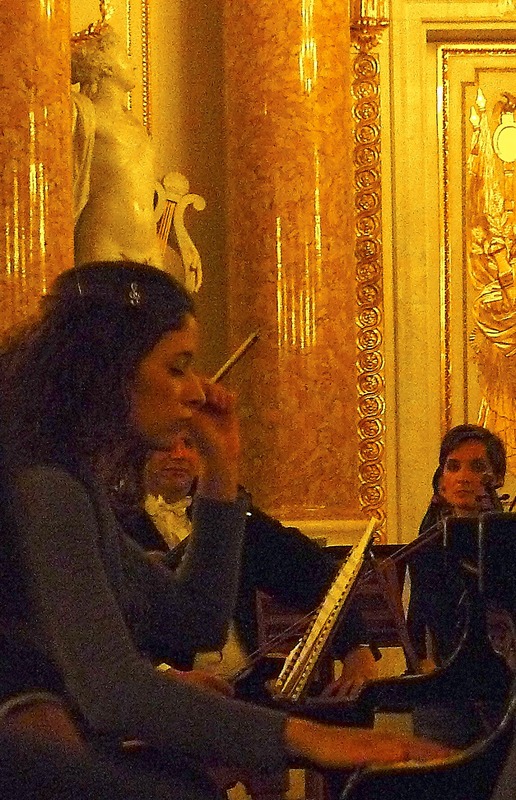 The soloist, Fabrizio Meloni, who is First Clarinettist of the Teatro della Scala remained is clearly a fine musician. He also has an excellent sense of humour and self-control. Between movements of the work, the loose music sheets from which he was playing fell to the floor. Quite unruffled by this, he gathered them up during the hiatus in a beautifully controlled movement and with witty eye contact with the conductor, continued unabashed. A priceless moment. The final programmed work was the delightful Rossini Sonata No.1 for String Quartet arranged for string orchestra. Only discovered after World War II, the compositionally fluent Rossini wrote six of these sonatas when he was a mere twelve years of age over a period of three days. They show the influence of Haydn and Mozart but also the seeds of his future operatic melodies and exuberant rhythms. In some ways it was a night of surprises and unknowns - all terribly Italian. Maestro Caldi was so taken with the superb roses given him we suddenly heard a contemporary Italian work entitled 'Masks' in five movements (five masks) with the First Cello of the Teatro alla Scala Orchestra as soloist. The composer, Carlo Galante, was even in the audience and rose to the applause at the conclusion. This extra work was a complete surprise to everyone I think, including the Italian Ambassador. Then followed yet another exuberant, demanding piece and yet another surprise. In the lively Allegrissimo Fourth Movement of Nino Rota's String Concerto, Maestro Caldi 'set the orchestra in motion' as it were like a clockmaker his mechanism and proceeded to walk away allowing them to perform alone. This was no doubt to confirm the tremendous virtuosic ensemble of this band and convince me ever more strongly that a conductor is scarcely necessary with musicians of this calibre. A remarkable gesture of self-effacement I thought! A delightful evening altogether to remind us of the very best in the Italian temperament, their undoubted charm and joy in creativity. Quite a task in the face of the present media onslaught concerning so much that is less desirable in the Italian nature.